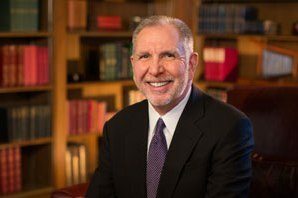 University of Washington President Michael Young, beginning his fourth year as leader of one of the foremost public research universities in the country, talked with Xconomy about university startups, technology licensing, and other ways the university can transfer knowledge into society. The interview, conducted in August in Young’s Gerberding Hall office, informed Xconomy’s broader look at the UW’s commercialization efforts, which Young has championed. The following has been edited and condensed for clarity. Xconomy: It’s an interesting time to be looking at how the UW is doing commercialization. There’s been a leadership change, a successful track record coming out of the last couple of years in particular, and at the same time some funding changes with the expiration of the Hall patents, which have been an amazing windfall or success—however you want to put it—over the last couple of decades. Michael Young: Success. We like to put it as success, not a windfall. X: At the same time, an outside commercialization committee’s report to you last fall paints a little bit of a different picture, calling the Center for Commercialization (C4C) harder to work with and seeking bigger financial returns for the deals it does than at other universities. The report begins: “For the UW to become an entrepreneurial ecosystem, the culture of the institution needs to change to encourage commercialization, and the systems by which the university operates need to change to encourage rather than inhibit commercialization.” Can you square that view with the results that the C4C has reported in the last two fiscal years in particular? MY: Yeah, a little tough, huh? So who’s wrong? The truth of the matter is nobody’s wrong. I mean, I’ve been pretty passionate about commercialization for a long time. The principal reason isn’t money. I mean, it’s great if we hit a Hall patent or a Gatorade or a Google or something and that’s terrific. But you never know that’s going to happen and you don’t plan around that. What you plan around is doing what is core to the university’s mission, which is doing good. Having an impact. And there are a lot of ways a university has an impact. The dean of our College of Education has his professors out in 100 different schools in 20 different school districts around the state, basically helping to develop curriculum, training teachers, taking data, and trying to understand better how kids learn and then applying that in a real-world, concrete way. Two thousand of our kids every year are part of the Dream Project. They go out and mentor young students in high school, the kind of overlooked kids who have a lot of promise but the counselors don’t really have time for to help get them transitioned to college and things like that. Lots of ways a university has impact. One of the ways is the commercialization process. If you cure cancer and it stays in the test tube, it’s great cocktail party conversation, I hope you’ll write a great story about it. But nobody gets better. I want to get it out into the lives of real people to make a difference, and to me that’s what the commercialization process is about. I think in the last few years we’ve made real strides. You can’t help but look at the data and say anything else. When you lead the nation in the number of licenses and active technology under license and when you’re in the top handful of universities in terms of spin-off companies, you’ve got to be pleased. But my view is you never should be so pleased, you’re not looking to improve. Let’s build on this great base that [former vice provost of commercialization] Linden [Rhoads] created and figure out what the next steps are. And what you find is when you do something well, you find ways to do it better, and you also find things you didn’t know about. If you don’t have any efficient processes for getting the intellectual property protection, you don’t get to a point where you can ask anybody to buy it, and if you don’t get to a point where you can ask anybody to buy it, you don’t know whether you’re asking too much or too little. So at an earlier stage, a lot of the things that committee helped identify were not things we could have even known, because, you know, we just, we were pretty bad at it. I mean not terrible at it. If you look at the number of companies over a two-decade period produced, it’s a healthy number, but obviously could be better. We’ve shown it could be a lot better in the last couple of years, and that gives us a foundation to now know what we didn’t know before and fix it. I view the report as very helpful, and the opening sentence, I think, is reflection of a desire on the part of the community to help us identify how to move to the next level. And that’s what we’ll be able to do. I’m wildly and inextricably optimistic, and I’m pretty sure that good things will happen. X: You challenged the university in February of 2012, about seven months after you arrived here, to double the number of startup companies produced each year over the next three years, and you’ve lately touted the record number of startups produced in each of the last two years as leading the nation. MY: They did in a year what I asked them to do in three. It’s a little hard to complain about that.